Montezuma Castle is one of the important historical sites, which today can be seen in the USA. 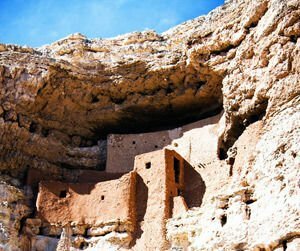 Montezuma Castle is actually a complex of dwellings carved into the rocks, which tells the ancient story that is more than 1000 years. Montezuma Castle is considered one of the best preserved and impressive rock homes in America and is notable among the historical monuments such as Wupatki, Tonto, Walnut Canyon, and Tuzigoot. Castle Montezuma is a makeup of limestone rocks in north central Arizona. Montezuma dominates the surrounding area of the river, Beaver Creek in the Verde Valley. The whole complex of Montezuma served for something like a building for the Sinagua Indians, who lived there for more than 600 years. It is assumed that the first to live there were the Aztecs at the time of Emperor Montezuma, but the truth is that the castle was abandoned almost a century before he was born. Sinagua Indians are from a tribe of whom made their homes in the rock galleries of Montezuma sometime in the 13th century, but a century later abandoned their homes for unknown reasons. It is believed that they had left the area due to the prolonged drought and lack of livelihood, or because of frequent conflicts with the Indians of the tribe Yavapai, which exist today. Most likely, if relatives of the Sinagua tribe lived nowadays, they would had been melded with other Indian groups. In fact, Montezuma Castle bears its name incorrectly to historical fact, because the Aztecs abandoned their stone cells well before the emperor was to be born. Incorrect is also that it is called, American Antiquity, because it is actually a complex of prehistoric rock dwellings. The complex is arranged on 5 floors which has 20 stone houses, which can accommodate for around 50 people. Around one million visitors a year visit the Montezuma Castle, which is declared as a national monument. In the area of this historic landmark there are no special conditions for camping, but on behalf of that were built many hotels, motels and places for accommodation only 30 miles from the resort. Castle Montezuma also had built a tourist center with an interesting museum where one can examine the artifacts.